“You’re only as old as you feel!” has become an infinitely old cliché. But it is more than likely that what we actually believe or what most of us truly feel, is that we’re only as old as we look. And this lead me to ask an interesting question – what exactly is it that makes us look older? Well, we’re all born with smooth skin but once we reach our twenties, we may be surprised to find ourselves with maturing skin. Our skin may start to lose its natural glow or elasticity. We may also notice more fine lines around key areas such as our eyes and mouth. With all the stress and bad habits that come with our hectic, modern lives, women are aging faster than ever before. And the signs- both internal and external, visible and invisible, start to manifest as early as your 20s. 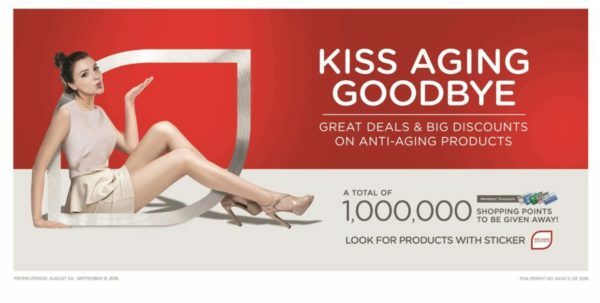 But fear not, Watsons is helping thousands Kiss Aging Goodbye in its latest anti-aging campaign. Fighting off the effects of age on the skin is something most people struggle with. But we don’t have to undergo expensive surgical treatments just to have younger-looking skin. There are a lot of ways to “Kiss Aging Goodbye” without busting the bank. Update your skin care regimen. This is the best time to start looking for anti aging creams with updated formulations. 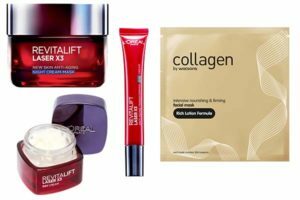 Try L’Oreal Dermo Expertise Revitalift Range—a skin care solution inspired by laser, that promises younger looking skin in 4 weeks! Or bring back your baby skin with Collagen by Watsons Intensive Nourishing Facial Mask, enriched with Collagen and Vitamin E to repair dryness and enhance skin’s elasticity. Also look for products with sun protection. UV rays stress out the dermis and impair the skin’s ability in regenerating important skin functions. You should look for products with high SPF for better sun protection. Aside from searching for the best beauty and anti-ageing creams in the market, revitalizing the building blocks of our skin should be the first step toward looking younger. A lot of the signs of aging we see on the outside is caused by the body breaking down on the inside. Calcium deficiency and lack of collagen are two common culprits. To help prevent a haggard look, you should give yourself the added nutrition you need in the form of food supplements and ingestible beauty aids. One of Watsons’ favorites is the iVi Collagen Ready-To-Drink, with 10,000 mg of Collagen that helps smoothen fine lines, and lighten dark spots for that forever-young glow. There you have it, the ins and the outs of anti-aging according to Watsons. But before you run out to the store, we will leave you with three things to remember. One, if you want to keep your beauty longer, keep your beauty bases covered from nutrition to skincare, inside and out. Two, you’re never too young to start looking old. Start preventive maintenance in your early 20s. If that ship has sailed, start as early as now. Three, there’s no better place to start your anti-aging regimen than the store that always brings you great beauty advice, amazing products, and fantastic prices. You got it! It’s Watsons! In line to its campaign against aging, Watsons recently launched a new promo. Defy aging with great deals and discounts on anti-aging products at Watsons for a chance to win a total of P1,000,000 shopping points with your SM Advantage Card from August 4 until September 21, 2016! Please see next page for the full mechanics and head over to the nearest store today! I used to think I did not need any anti aging…. now that I am 30 I am thinking I need some…. and its good to know that a more expense one is not better. Watsons is a great beauty store. I’m sure my mom would love it. These sound like amazing products for anti-aging. The powder drink would be really cool to try out. Sounds like an awesome deal to take advantage of! And what’s even better is that you get the chance to win as well! Drinking lots of water, eating right, exercising and using more natural products is a great way to keep yourself looking and feeling younger. I also think we should embrace aging as a sign of wisdom and not as a sign of irrelevancy. I could really use some extra collagen these days! After 2 kids, my body just isn’t like it was! It’s true, you only have to give in to age if you decide not to work and don’t do your homework. Great products! Hope I win in this promo! I want those points para unlimited shopping! Wow, this is great. I will tell my mom about this, she is asking me of a beauty essential that prevents skin aging. These look like some awesome products! I’ve actually never heard of Watsons before. I’ll have to see if they have one near me. Awesome set of products. Looks really helpful for many. This is a great campaign. I like these product, every woman should know about this. I heard so many good things about Watson beauty store, i have to try it out! Anti aging is something i might wanna invest in. Well what a great offer…And I know most people would love to defy age. Yet its the most natural thing i life and so maintaining great health is awesome , but defying age, now thats a miracle I would love to observe! I am always up for any battle against aging; whether it is drinking more water, exercising regularly, or trying an anti aging product. This sounds like a great offer. I love shopping at Watson’s. They have a wide range of Korean face masks, and they’re amazing. We can’t stop aging, but we can delay it. Thanks for sharing!